Chasing Davies: Smell me, I dare ya! Smell me, I dare ya! A Classic. One I've never actually owned, but one of my best friends wore this in High School (Max - do you still wear it?!) and I use to steal sprays. It reminds me of her. 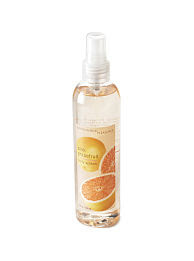 This sweet and girlie fragrance is light and airy. An oldie, but a goodie. This subtle, cool fragrance is a long-time fav of mine. I have mentioned many times...but Philosophy's Grace is a huge fav. It's so simple, subtle and clean. I use the lotion every morning and find myself sniffing my arm throughout the day. Weird, I know. Anything by Bath and Body Work's Pink Grapefruit Classic Line. I can sniff this scent out anywhere - my friend uses the soap, a co-worker uses the lotion, I also have soap and lotion. This smells makes me so happy. I love light and girlie, but subtle scents. What I put on, can really help my mood. What scents do you love?